Remember those lovely, delectable, little cocktail samosas from the afternoon tea last month? You can finally get the recipe and see how the maestra makes them. I have a guest post up today over at my dear Manisha’s blog: Indian Food Rocks, because Indian food truly does rock and because sweet Manisha is on travel in INDIA! This was a joint effort: she cooked and dictated the recipe and methods, I photographed, took copious incomprehensible notes, and wrote up the post. So please hop on over and show Manisha some good ole use real butter love: cocktail samosas. They look mighty yummy. Your photo makes me want to crunch right into one…or two. I just had samosas at a resto recently. I’d love to make them at home! I love Indian food and these samosas look delish! 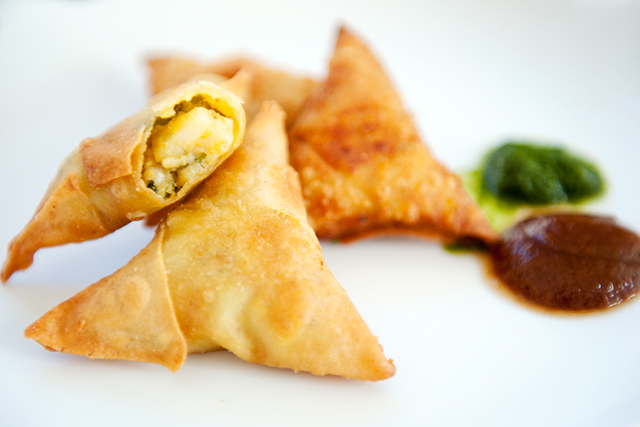 I am so craving a samosa right now…those look fantastic. They look lovely, but the site is down so I can’t check them out. Ugh! Her site is down, but I’d really love to sample them. Hi all – it seems that Manisha’s site is down at the moment and as you can imagine, it isn’t easy for her to address the problem while she is traveling in India. I’m really sorry :( I’m sure it will be up eventually, just not sure when. Sorry about my site being down. My domain was supposed to renew automatically but it did not. :-( Not something I wanted to have to deal with when I am traveling and on Internet speeds that are worse than dial-up. It’s up again now!